Experts say budgetary concerns mean Scotland's repairs backlog will only get bigger. 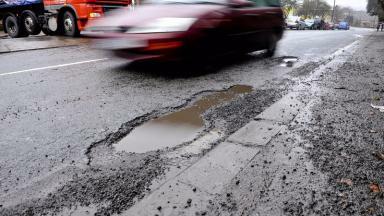 Scotland's roads are likely to deteriorate even further due to budget cuts, a new report has warned. The Institution of Civil Engineers (ICE) said a lack of long-term funding deals for roads maintenance meant that while the network has so far been maintained at a "steady state" despite budget cuts, it was "unlikely this could continue". The ICE issued the warning in a new report looking at the condition of infrastructure in Scotland in 2018. That described roads infrastructure as being "one of Scotland's biggest capital investments" with 56,000km (34,796 miles) of roads across the country. The transport agency Transport Scotland is responsible for 3600 km (2236 miles) of motorways and trunk roads - about 7% of the total network - while local councils are responsible for 52,400km (32,559 miles) of A, B, C and unclassified roads. While ICE said almost two-thirds (63%) of local roads were currently in an "acceptable" condition, spending on road maintenance has been cut by 14% between 2011-12 and 2014-15, with "further cuts anticipated". In addition, there is a "well-known £1.2bn backlog of road maintenance". The report said: "Neither trunk roads nor local roads in Scotland receive long-term funding settlements. "This makes it more challenging for Transport Scotland and local authorities to deliver long-term asset maintenance plans and renewals. "While local authorities have maintained a steady state in road condition despite cuts, it is unlikely that this can continue." ICE suggested a move away from the current taxation regime - which sees many electric vehicles pay no vehicle excise duty - could present "an opportunity to reassess the approach to how road maintenance funding is delivered". The report added: "ICE's research indicated that 52% of respondents in Scotland (from a GBwide poll) support 'pay as you go' as a replacement for VED and fuel duty, and 55% would support it if it meant more money would be spent on improving and maintaining roads in their local area. "Scotland was more supportive of 'pay as you go' than other areas of the UK, especially if it is hypothecated to road maintenance." A Scottish Government spokesman said: "The National Transport Strategy is currently looking at challenges facing our transport system and how we can take advantage of any new opportunities that present themselves. "This will inform the Strategic Transport Project Review which will set out Scotland's transport infrastructure investment priorities for the next 20 years. "Maintenance of the local road network is the responsibility of local authorities. Despite continued UK Government real-terms cuts to Scotland's resource budget, in 2018-19 councils will receive funding through the local government finance settlement of £10.7bn. "Responsibility for improving motorways and trunk roads lies with Scottish ministers and the budget for maintenance of the network has increased by around £65m to £433m for 2018-2019."